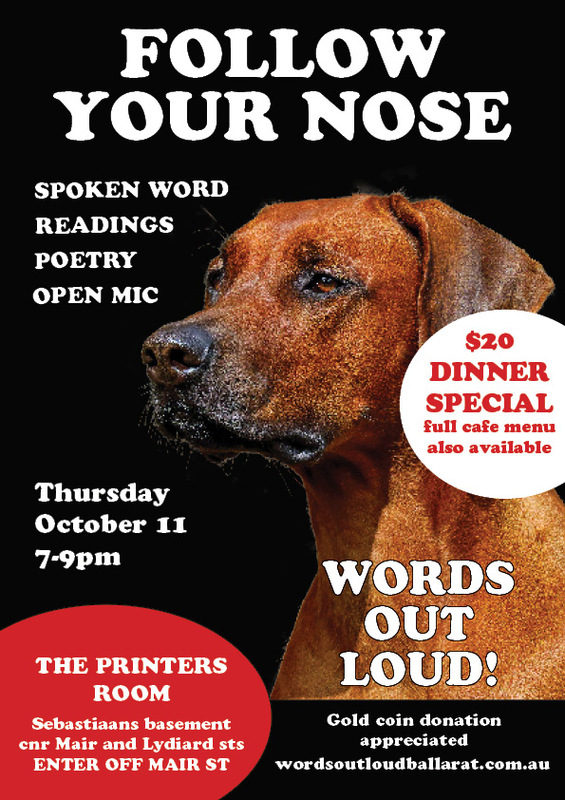 Words Out Loud is turning super sleuth in October and ‘following its nose’ to a great evening of spoken word. 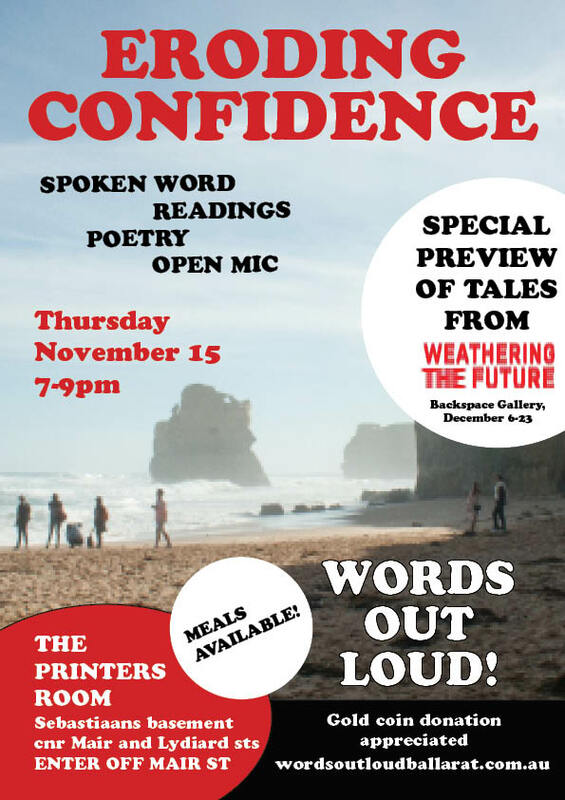 The October 11 event (note: this is a week earlier than it normally would be) will be held at the Printers Room, in the basement of Sebastiaans at the corner of Mair and Lydiard streets. The full menu will be available, as well as a $20 two-course meal deal . Doors open about 6pm if you’d like to dine early. The event encourages poets, writers and raconteurs to share their work, or favourite pieces by others, for five-minute open mic sessions. The theme isn’t compulsory. We’re getting some spring wind beneath our wings (not hard to do in Ballarat!) and ‘taking flight’ in September. The September 20 event will be held at the Printers Room, in the basement of Sebastiaans at the corner of Mair and Lydiard streets. The full menu will be available, as well as a $20 two-course meal deal (there might, or might not, be golden syrup dumplings for dessert). Doors open about 6pm if you’d like to dine early. 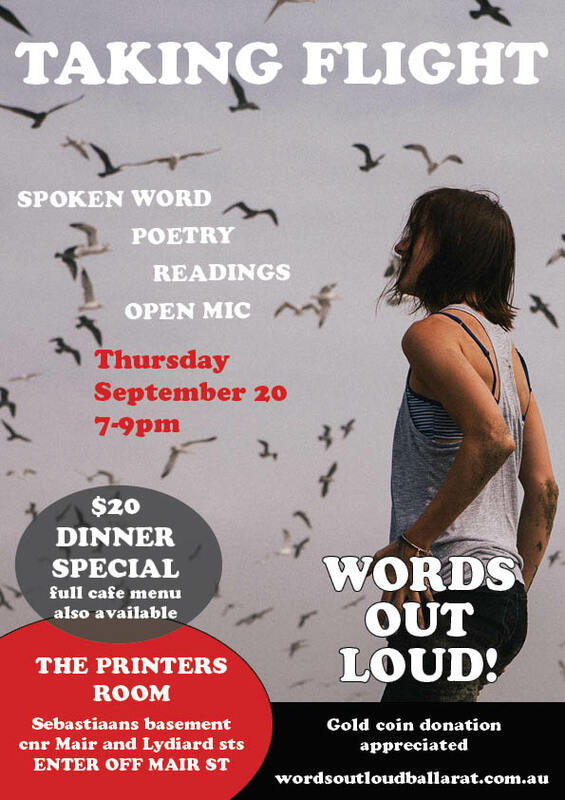 The spoken word event encourages poets, writers and raconteurs to share their work, or favourite pieces by others, for five-minute open mic sessions on the third Thursday of each month (except October, when we’re running a week early). The theme isn’t compulsory. Enter via Mair St. Drink and food available before and during. Take in the (chilly) air in the beer garden. Enjoy the show from couches, the tables or a seat by the bar. Gold coin donation appreciated. Performances begin from 7pm. 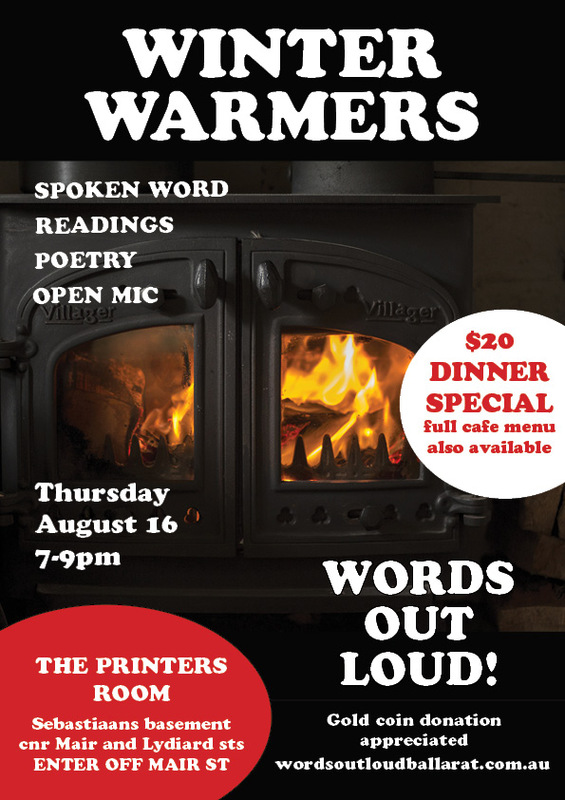 We’re turning up the heat for August’s edition with the theme of ‘winter warmers’. The August 16 event will be held at the Printers Room, in the basement of Sebastiaans at the corner of Mair and Lydiard streets. The full menu will be available, as well as a $20 two-course meal deal (dessert: maple syrup dumplings). Doors open about 6pm if you’d like to dine early.